Jan. 25, 2019: International Space Station Configuration. 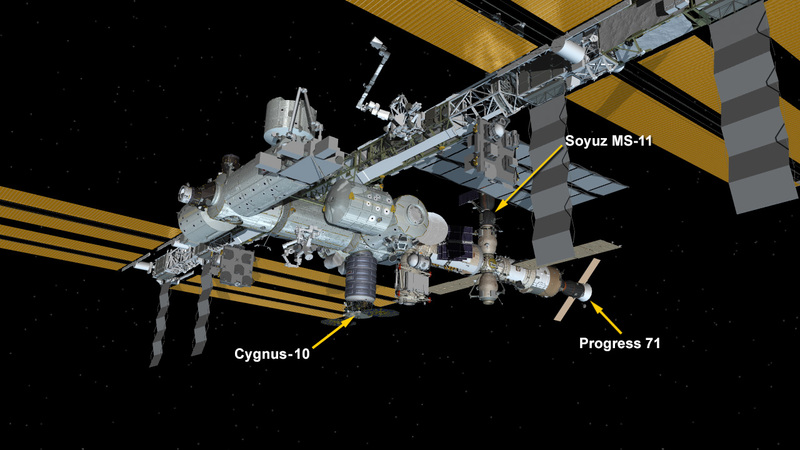 Three spaceships are parked at the space station including the Northrop Grumman Cygnus resupply ship and Russia’s Progress 71 resupply ship and Soyuz MS-11 crew ship. Rather than allowing the used hardware and experiment leftovets to be burnt in the atmosphere. Specially designed containers could be made to store the debris inside those containers and strategically placed on the outside of the space station. Would slightly protect crew from solar radiation and micro meteorites. If stacked outside the spacestaion enough times, would add up to a lot of shielding. Plus if another craft needed any shielding it could potentually shed some of these containers to add to the shielding of this other craft. Recycle and save cost of not having to bring more material in space for shielding. beautiful job well done Expedition 58-59! Containers full of recycleables if placed and stacked in between modules could also act as reinforcement and or structural support for the various attached modules as well or to add for such space structures for the likes of space telescopes or spacecrafts. Structural supports. Glue items inside the containers would probably be the best solution so as to not contribute to more debris in space it it’s hit by micrometeorites. this is wonderful, got to say keep it up!